There couldn’t be more hype around Beat Saber, which is currently the best rated game on Steam. There are countless gameplay videos on Twitter, Facebook and YouTube. We got the chance to unpack the lightsabers and cut up the blocks. Will the game be able to keep its promises? What makes a good VR game? VR games are one of those things. On the one hand, players can immerse themselves completely in a new world. On the other hand, there’s a lot of hurdles before you can really get started. If you want to immerse yourself in a sophisticated world like Arktika.1 or Skyrim VR, you have to first learn a lot about the VR game before these complex experiences can really inspire you. Beat Saber elegantly avoids this problem: the aim of the game is to cut through virtual cubes with a lightsaber. The cubes fly in rhythm with the music towards the player, who has to slice them in the correct direction. What sounds almost too simple is actually one of the best VR games currently available for PC-based VR with Vive, Oculus Rift and Windows Mixed Reality. This starts with the menu navigation, which first asks for the game mode and then the music selection, and finally lets you determine the level of difficulty. Press “Start” and off you go. The first cubes fly toward you with the beat of the music, and their colored markings indicate which of the two lightsabers you need to use and in which direction you should cut them. Blue means right, red means left. With every cut, the controllers vibrate and the haptic feedback provides a great sensation. The levels are designed by hand, there’s no automation. Unfortunately, you can’t add your own music collection. Ten pieces of music were composed especially for Beat Saber and they cover a lot of musical styles. Whether you like dance or hip-hop, alternative, or rock: there is something for everyone. My favorite track is Escape. Each piece of music has four levels of difficulty, which differ in the fact that the cubes rush in at shorter sequences and sometimes require new and more difficult cutting combinations. In the video, I’m playing the on the Hard level, and there’s hardly any time to react to the flying cubes. So it’s necessary to know the level by heart, because otherwise you’ll miss individual cubes and the level could end prematurely. This is all the more true in Expert mode. The great thing about Beat Saber is that practice makes perfect. After only a few attempts, I got through Normal mode without any mistakes, although not with impressive scores. It takes more practice in Hard mode and even after several hours, I was still not in step. If you like, you’ll know that dicing onions is something you do more out of necessity than out of passion. That’s just like Beat Saber, since cutting the blocks is only one aspect. The other is of course to get the highest score to climb up in the rankings. So you’ll need to therefore perform particularly excessive cutting movements. But this gets in the way with the speed of the levels. So what do you do? Dancing movements help, as does intensive work with your wrists. And you’ll have to be quick, of course. In some places I almost lost the controllers in an attempt to make my wrists as loose as possible. So a Beat Saber quickly becomes a fitness workout. In party mode you take turns at one computer and can play against each other for the highest scores. The VR computer therefore quickly becomes the perfect fun station for any party. A direct comparison against friends is only available as a highscore table on Steam or Oculus. Beat Saber is available for $19.99 from Stream and Oculus Home. The game is officially in an early access stage. More audio tracks have already been announced, and there will soon be a level editor as well. This will let you bring your own music into the Beat Saber universe. Beat Saber is a bit like Space Pirates Trainer to me: the principle of the game is almost too simple to expect perfect VR gameplay, but the opposite is true: Beat Saber has this perfect simplicity and within seconds players are immersed in the Beat Saber world. Like few other VR games, Beat Saber manages to implement a simple principle in such a way that it effectively exploits the possibilities of VR environments with motion controllers. Players have long-term motivation because of the fitness factor. After some time, the levels are no longer really challenging and not every song really inspires you. The developers of Beat Saber have landed some lucky breaks with their marketing. There are spectacular mixed reality videos that can be seen everywhere on YouTube and Twitter. The lightsabers of course have a real Star Wars appeal that fits perfect with the times. Even if the hype will fade at some points, Beat Saber is a big hit, and will be even better when more music becomes available. 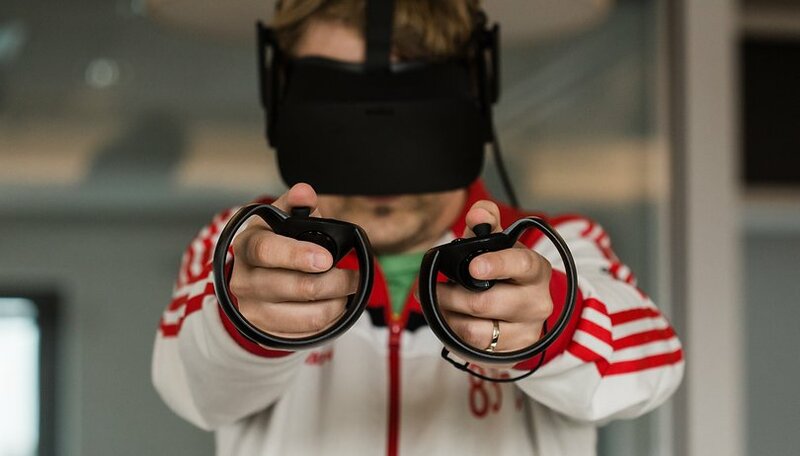 Have you tried PC-VR headsets and Beat Saber? Let us know what you think!